Hilo Beauty only gets about 2 feet tall with 12 inch leaves but it makes a real impact in the garden. No other elephant ear displays such outstanding variagation. I grew this for many years but sadly it’s no longer in the garden. Not sure where it went but probably it died in a hard winter freeze. There is a lot of disagreement on this plants taxonomy. 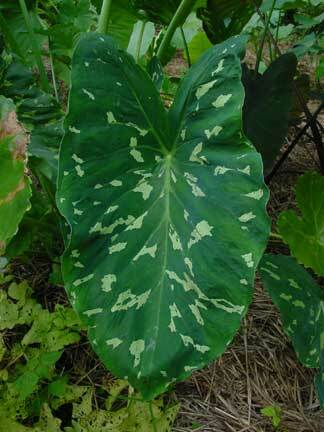 Some say it’s Alocasia, others say Colocasia. Either way it is a hybrid and never flowers so no one is sure which plants are it’s parents.